A legendary beast may have just been found deep in the jungles of Brazil that could shed light on the evolution of dinosaurs and birds. A strange fossil discovered in Brazil has scientists excited that they may have just found an early ancestor to modern-day birds and crocodiles. An international team of scientists from Brazil and the United Kingdom have determined the Teyujagua paradoxa lived 250 million years ago in what is now southern Brazil, according to a University of Birmingham statement. 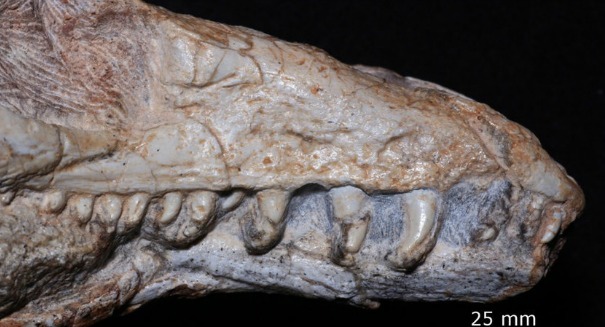 The toothy fossil was found in an area of exposed Triassic rock near Sao Francisco de Assis. At that age, the creature would have been around at the time 90 percent of living species on Earth had gone extinct due to the Permo-Triassic mass extinction, likely as a result of a massive volcanic eruption in eastern Russia. Such a find could shed light on how vertebrates called archosauriforms evolved. Archosauriforms eventually turned into dinosaurs and later birds and crocodiles. The Teyujagua fossil is like nothing scientists have ever seen before, and could be an ancestor of such a diverse group of animals. More importantly, Teyujagua fills a gap in between the time when more primitive reptiles turned to archosauriforms, and thus allow scientists to see how its skull evolved. Teyujagua wasn’t a huge animal, stretching just about five feet in length at the most. It was small and quadrupedal, unlike its namesake, the Teyu Yagua monster from Brazilian mythology that had the head of a dog. This lizard doesn’t resemble a dog, but scientists still thought it appropriate to name it after the legendary beast.